Joshua Rieger is a native of Texas with an avid interest in astronomy and is on a personal quest to help Icarus Interstellar develop the knowledge infrastructure to galvanize the global amateur astronomy community into a focused effort that will see amateurs hunt for exoplanets. His ambition is to help Icarus develop a ‘wiki’ full of knowledge and information that will help educate and organize the community toward this objective. When you think of an astronomer, what do you picture? A house-sized observatory, filled with scientists, giddy as color images come rolling in? Or do you picture a handful of scientists, sorting through endless mounds of data that have been collected over a couple hours of observation without any of the breathtaking images you see in books? If you imagined the latter, you would have a much more realistic idea of what it means to be a professional astronomer. Professionals in the field of astronomy simply cannot use their observatories at their whim. The operation costs of these professional installations are staggering. When taken into account the amount of money and energy required to run an observatory, one begins to realize why we are unable to spend more time searching the night sky for extrasolar planets. With billions and billions of stars in the Milky Way, it is nearly impossible for professional astronomers to continue collecting data on previously discovered exoplanets, let alone observe each star, looking for a new exoplanetary system. 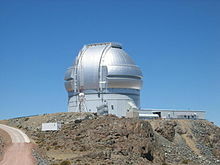 The Gemini Observatory, located in both the Hawaiian Islands and the mountains of Chile, is comprised of two 26.9′ telescopes. The government budget for the construction of this observatory was $193 million dollars, while consuming another $10 million dollars per year in operating costs. Since this project was a venture between seven countries, the Gemini Observatory maintains an “open sky” policy, meaning any country is free to use the facility within reason. Requests for reserved time are sorted through, and only the most relevant are accepted. Once this happens, the allotted time per request may be as long as a few nights, or as little as an hour. With numbers like that, the importance of the amateur community begins to come into perspective. “When we discover the means for interstellar travel, which planet will we visit first?” Before this question can be answered, astronomers must conduct repeated observations of an exoplanet in order to decide whether or not it would be worth our efforts traveling to. As an extrasolar planet orbits its parent star, the exoplanet will block out a small portion of the star’s light, similar to the way Venus passed between Earth and our Sun in June of 2012. This is referred to as a “transit.” As the exoplanet’s orbit takes it directly between its star and the Earth, the star’s apparent magnitude seems to dim for a period of time, then rebound to its original magnitude as the exoplanet moves to no longer obscure of our view of the star. The start, duration, and end of the “dip” are the focal points in creating a light-curve graph. In order to create a light-curve graph by use of the transit method, amateur astronomers need to capture a series of images containing the target star and reference stars, a process known as differential photometry. A reference star can be any additional bright object that is near the target star; this allows the astronomer to compare data collected from the target and reference stars to rule out atmospheric anomalies created by viewing from a ground-based telescope. Unfortunately, the process of capturing viable images is not as simple as pointing and shooting. A background in astrophotography will greatly increase an amateur astronomer’s success in their exoplanetary endeavours. Next comes the analyzation and processing of the images. For a good number of people without any astronomical experience, the type of data collected can be overwhelming and confusing. Learning to comprehend and apply the data is a process that will take time and effort on the amateur’s part. Utilizing certain techniques such as polar alignment, defocusing, eliminating systematic error, subtracting dark frames, and preparing a flat field, will also have an enormous effect on results. Bruce L. Gary (not to be confused with The Knack’s drummer, Bruce Gary), has written an amazing book on extrasolar planet observation dedicated to amateur astronomers. Anyone, with patience and the eagerness to learn, can be taught to detect an extrasolar planet. 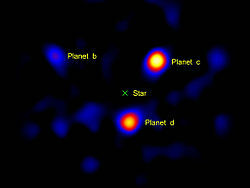 2MASSWJ1207334-3932b, the first exoplanet to ever be directly imaged. Image courtesy of ESO’s VLT. The first amateur observation of a planet orbiting around a star other than our sun, was by a team at the Nyrölä Observatory of Finland, a privately owned amateur observatory. On the 16th of September, 2000, a 16” Meade LX200 was aimed at HD 209458. This star is known for being the parent of the first exoplanet discovered, just a year before in 1999. The telescope was equipped with an SBIG ST7E CCD camera, a photometric V-filter, a Meade f6.3 focal reducer, and JMI’s NGF-S digital focuser. After a night of observation and data processing, a light-curve graph showed the orbit of HD 209458b around it’s parent star. Without going into far too many depressing figures, the equipment used is generally far outside of the typical amateur’s price range. Tonny Vanmunster made history by being the first amateur astronomer to detect the transits of exoplanets TrES-1b and TrES-2b, in the constellation Lyra. In Landen, Belgium, Mr. Vanmunster aimed his Celestron C-14 with SBIG ST-7XME CCD imager at a star creatively named GSC 02652-01324, and captured light differentials caused by both exoplanets. Mr. Vanmunster has also contributed to the discovery of five more exoplanets. Without factoring in the telescope mount that Mr. Vanmunster used, his equipment cost at least $6,000; still a bit steep for some amateurs. Less than a year later, Ron Bissinger of California became the third amateur astronomer to detect an exoplanet. With his 14” Celestron SCT and SBIG ST-10XME CCD, Mr. Bissinger observed a partial transit of HD 149026b. According to the information that was given, Mr. Bissinger seems to have around a $10,000 setup. Due to technology becoming more and more affordable, amateur astronomy is becoming an increasingly large field of interest. Transitsearch.org has a link to a database of extrasolar planets for amateur astronomers to detect. The amateur astronomers, who are listed above, would be considered very serious amateur astronomers. While having large telescopes and high definition imagers will definitely aid in your exoplanetary search, they are not required. Amateurs continue to push the limits on what can be done with more affordable equipment. AstronomyOnline is an website owned and operated by a legally blind astronomer and photographer, Ricky Murphy, who has dedicated his online work to furthering the education of aspiring astronomers. On his page, he displays a light-curve graph of HD 209458b’s transit in front of its parent star. When compared to a professional graph of the same transit, the two are nearly identical. The amateur detection was made with an 8” telescope and a 765×510 pixel CCD camera! This is amazing: for approximately $4,000, any amateur could have the same equipment setup, and duplicate the results themselves. Think that’s impressive? Michael Theusner, a “meteorologist, amateur astronomer and IDL software developer from Hannover, Germany,” as stated on his website, decided to experiment with small aperture telescopes, to test the possibility of capturing an exoplanetary transit with “modest” equipment. Sure enough, Mr. Theusner observed a transiting planet around HD 189733 A, with a 2.4” telescope! The possibilities that are created by such an experiment are positively exciting. 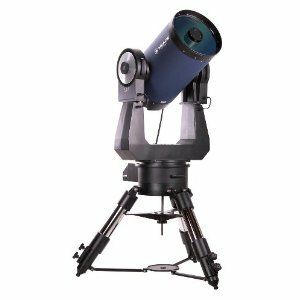 There are quite a few well-known telescope companies, each marketing hundreds of telescopes, mounts, and imagers, all touting to be the best. Anyone will tell you that their telescopes will outperform the competition’s telescopes. When it comes to brand names, it is entirely personal preference. As a baseline, any setup for exoplanet observation should include a computerized mount, as hands-free tracking is absolutely essential. While reports have surfaced of exoplanet detection using apertures as small as 2.4”, the average size of apertures used by amateurs seems to be roughly 12”. $400 – Any laptop that satisfies your technical desires from your friendly, neighborhood computer store. In short, for less than $2,500, an amateur astronomer could create their own observations and light-curve graphs. 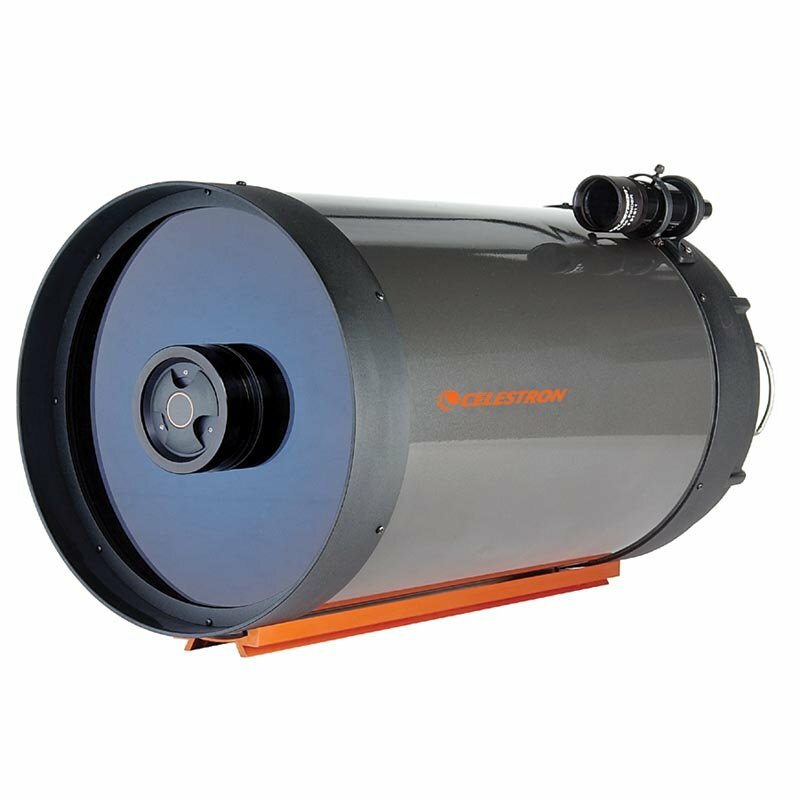 Please bear in mind, this telescope, mount, and camera are based entirely on the author’s opinion; everyone has their own set of personal preferences. 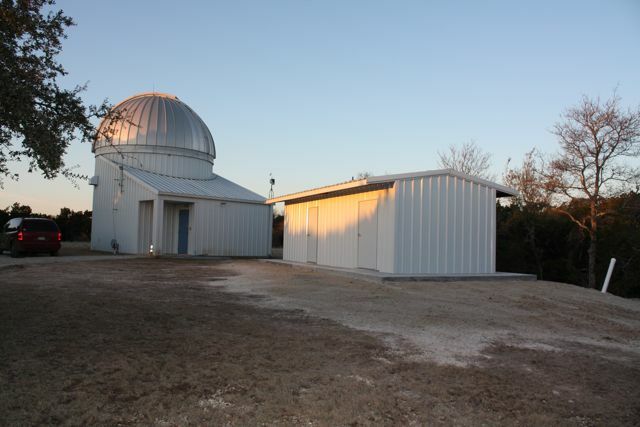 The Paul and Jane Meyer Observatory, located between the towns of Clifton and Turnersville, TX, is privately owned by the Central Texas Astronomical Society. Mr. Bradley Walter, the AAVSO Representative for CTAS, said in a recent email “We observe known exoplanets and record light curves to refine data. We are working toward doing confirming observations to assist with the confirmation of candidates. In general, we limit our targets to transiting planets having transit depths of 10 millimags or slightly less. 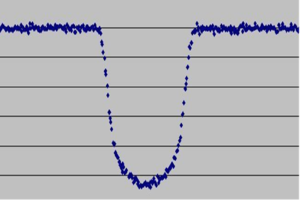 However, one of our members has captured a Kepler candidate transit light curve with much less depth than that.” A “millimag” is a very precise level of measurement in astronomical photometry, when calculating the apparent or absolute magnitude of a celestial object. Due to the exoplanets being so much smaller than their parent star, only a very small portion of the star’s apparent magnitude dims, which calls for unbelievably scaled down measurements. The Meyer Observatory houses a 24” aperture telescope with a Roper VersArray 1300B camera. To find a source of previously discovered extrasolar planets that you can detect, the ETD will be your best friend. The Czech Astronomical Society is father to the Variable Star and Exoplanet Section, which hosts the Exoplanet Transit Database, or ETD. This database houses collections of observations from over one hundred transiting exoplanets. The data and light curves have been submitted not only by professional astronomers, but amateurs as well, and is home to a wonderful tool to “model-fit your data.” Amateur astronomers also have the option to view future transit predictions to aid in their personal observations. To find a local astronomy group near you in the state of Texas, Go-Astronomy is a website with a very impressive list of contact information. If you wish to contact a group that focuses on exoplanet observation, the European exoplanet site is dedicated to astronomy programs worldwide. The numbers of the amateur astronomical community are growing quickly. Being a contributing member to an astronomy club, or even to Icarus Interstellar, does not require ownership of expensive equipment. Advances in technology are happening at a very rapid pace; where will you want to be when humanity achieves interstellar flight?